The title of this article is ambiguous. Ultima (Disambiguation). 7.57 points at 14 votes (rank 178). Arrival in Sosaria. To the right of the character one of the numerous time gates has just opened. After a courageous adventurer defeated the arch-villain Mondain in Ultima I there is peace for a long time. But wild rumours are abound about a female wizard apprentice that is supposed to have been instructed in the black powers by the evil magician. And then these rumors are actually confirmed after years of uncertainty: Minax – so the name of this horrible witch – has become a strong magician, even mightier than her mentor Mondain. And she only wants one thing: revenge. Same as her master, she also has the ability to travel through time. So she moved far back to the Land of the Legends, which is the point of origin for the further development of the Earth. There she grabbed the power and thus changed the course of the game to evil, up to a nuclear holocaust in the far future. But there is still one hope for rescue: By Mondain's death such strong concussions were caused in the space-time continuum that cracks appeared. At certain places on the Earth it is now possible to travel through time by these racks (time gates). A group of researchers has put up the thesis, that everything can be turned around again if someone destroyed Minax in the past. And now you take over this hero, the knight in shining armour and try to fulfill this deed. Ultima II has a sophisticated role play system and the surrounding in which you need to get your experience is a huge and complex world. You travel by foot or horse over the landscape, sail with a frigate over the sea and you can even fly with planes and space shuttles. In the huge world you cannot only visit Earth in different epoches but also travel to far away planets of our solar system. During this you use up food and lose hit points if you meet enemies. If you are successful in fights, you will not ony get gold and other items but also experience points. You will also find towns in which you can buy different armour, weapons and food. In conversations with the population you learn about important details about the life habits and customs of the country. Do not let out a conversation, you will always get to know something that you can use later. In the later course of the game you will also get hints to your task and you will learn where you can supplement your travel cash without any dangers and heal your wounds. Here the player examines the island Greenland. At the top you can see the entrance to a dungeon. At the left on the coast a frigate lies at anchor. The second part of the series is also designed in the 2D perspective that is typical for the early Ultima parts. The game landscape consists of graphically simple and - with exception of the ocean's waves - unanimated symbols for the different types of terrain and enemies. 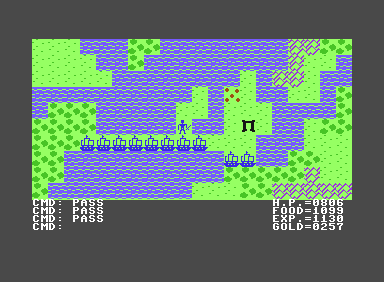 Fights against enemies take place directly on the map, there is no separate fighting screen. When the character enters one of the numerous places that are allocated over the different time zones, another two-dimensional map of the new surrounding is shown. By moving the character over the border of the map of the entered location you return to the world map. The inside of dungeons and towers is shown in a simple 3D view. In the lower part of the screen are the commands that were entered last and their consequences shown, while there is an overview of the most important status attributes (hit points, food, gold, experience) at the lower right. A detailed list of all carried items and all the character's attributes needs to be called up by pressing the key Z . 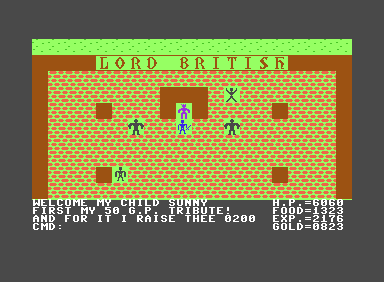 It is striking that significantly brighter colours were used when designing the game area in comparison to the Apple II original version and that they went without a title graphic. The sound in the game is limited to some few acoustic signals and simple sound effects, there is no music. The game is round based, but a timer makes sure that a round is passed idly after a few seconds without input. As this does not only cost food but enables also an available enemy to make his move, the player is latently pressed for time, unless he calls up the overview screen. All enemies in the game are equipped with a simple guidance routine that leads them towards the player's character on the most direct route that is possible, whereby obstacles that block their movements are not bypassed. 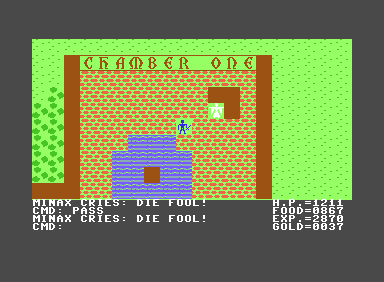 Of all parts in the Ultima Saga on the C64, Ultima II plays most fluently thanks to the efficient graphic routines and fast processing of the entered commands. In contrast to the other Ultima parts is Ultima II not always dead serious. In fact, style clashes and anachronisms are a daily occurence, as in this situation in which "Ronall Mc Donall" informs us that his convenience restaurant now also serves mounted guests. This is the template for your own player disk and MUST also NEVER be changed. You MUST COPY this disk and then label this copy as PLAYER DISK. With this copy, that now carries the name PLAYER DISK, you will traverse your adventure. As for the originial ULTIMA 2 - PLAYER MASTER: lock it in a safe, give it to your wife, etc. BUT NEVER EVER PLAY WITH THE ORIGINAL "ULTIMA 2 PLAYER MASTER" !!! On this disk is all data for the area outside the Earth and for the 9 planets of the solar system in detail. You will need them only in the later course of the game. Also this disk must NEVER be changed!! 2. Label this copy with "PLAYER-DISK" and maybe the name of the character e.g. : "PLAYER-DISK (Gandalf)"
3. Lock away the original "ULTIMA 2 - PLAYER MASTER" and when the programme asks you to insert the "PLAYER DISK", then insert the copy that you have made. BUT NEVER!! USE THE ORIGINAL "ULTIMA 2 PLAYER MASTER" FOR PLAYING. With the help of a "borrowed" plane and the time gates it is possible in the later course of the game to explore also remote places like the British Isles. Lord British, the legendary ruler over Sosaria grants the player new live points to a maximum of 990 for each 50 gold pieces. First, you should create yourself a character that you want to steer through the world of ULTIMA II. There is a demo character on the original disk, but if you seriously considered being able to defeat the magician MINAX with this character, you should read this chapter very carefully. STRENGTH: Is the body pwer and means in this game the ability to seriously hurt the enemy in a fight and to carry heavy armour. To be able to carry the Reflect or Power Armour required for the flight into space, the strength needs to be at least 29 or 31 points. AGILITY: This is ostensibly the skill that you have to use a weapons. The higher the skill, the more effective can the weapons be used. The success rate in stealing is raised by high skills. STAMINA: Is the ability to defend oneself against attacks from enemies and diminishs the damage taken by hostile hits additionally to the armour. CHARISMA: With many points in this category you are utterly skilled and nifty when trading with merchants, which becomes noticable in significant rebates. WISDOM: This is the ability to use clerical spells as effectively as possible. INTELLIGENCE: The general effect of a low IQ should be generally known. In this game, more points especially raise the sophistication when trading with all creatures and when making contracts. Furthermore, an intelligent magician can use his magic more effectively. The same system is used for chosing the profession. Only the corresponding points are raised by 10 points. When you are finished, you have won a brave friend that you hopefully lead with due caution to the fight against MINAX. Open a lock. Needs a key. View from the bird's perspective or from a spaceship onto the planet (magic powers necessary). Go north. Go forwards in a dungeon. Go west. Turn left in a dungeon. Go east. Turn right in a dungeon. Go south. Go backwards in a dungeon. To be able to see in the dungeons and towers at all, you need torches which you receive when defeating thieves in the upper world. Some utterly displeasing enemies as ghosts that blow out your torch again and gremlins that steal masses of food when they hit make life miserable for you there. Fortunately, visiting the dungeons is not compulsory (s. tips). With the help of these commands you need to fight your way through the world of ULTIMA II and find the magician MINAX and kill her. The screen is divided into two big parts. The biggest part is taken in by the graphics window. Here you see your fosterling walking around. At first, you only see a big map with different signs. If you now steer your character to a sign for castle, village or town, the corresponding place is shown in detail and you can trade there are talk. The lowest part of the screen is again divided into two parts. At the left you always see CMD:. This is the shortage for COMMAND and you will notice that the corresponding command appears behind the colon if you press one of the command keys. Also the directions are shown here. If you have not pressed any key after a certain time, the word PASS will appear in this line. To the right of this command line you see different shortages with numbers after them. The shortage H.P. means HIT POINTS and shows how many attacks you still can endure. For each hit that you take the number of HIT POINTS is reduced. At H.P. : 000 you character will die. The number of subtracted points depends on the strength of the enemy. The next line shows the supplies that you carry around with you and constantly eat. This means, that food is automatically subtracted and you also need to take care here, because wenn is says FOOD: 000 you are as dead as when you have H.P. : 000. Therefore it is important to regularly provide food. The shortage EXP. means EXPERIENCE. As you gain more and more experience in each fight, you will get more points here depending on the difficulty of the fight. The last line shows your possessions of Gold. With this you can pay equipment, weapons and food or buy information. This section of the screen with these lines is very important and you should constantly look after the values so they are all "in the green zone" (min. 400 Hit Points, min. 200 Food). The receptionist in the "Hotel California" in San Antonio is obviously a fan of the "Eagles". For each 100 gold pieces that you offer him, there is a 50% chance that he raises a random character value of the player by 4 points. 1. LIGHT: Creates magical light and substitutes a candle. 2. LADDERDOWN: This spell teleports you one level downwards in a dungeon or tower. 3. LADDERUP: Exactly the opposite to the upper spell. It transports you one level upwards. 5. SURFACE: With this you are teleported to your home planet. 6. PRAYER: This spell prays for divine assistance in the fight against an enemy. Maybe the enemy is instantly eliminated. 7. MAGIC MISSILE: A dangerous magical weapon against the enemy. The vigour depends on the current level of the Wizard. 8. BLINK: A spell for dangerous situations. You are teleported somewhere. 9. KILL: A very unpleasant thing for the attacking enemy. First you type M(agic). Then you need to choose the desired spell. For this you enter the corresponding number that is written in front of the spell. Now a spell is ready to be cast. If you now want to dispense magic, simply enter C(ast) and the effect should show very quickly. You can only use spells in towers and dungeons. This is also where they are especially necessary because really all spawn of hell lives here. Furthermore you cannot wildly and spontaneously start conjuring up a spell. You need to buy the spells in town. For this there are Wizard and Cleric houses where you can purchase the magical treasures. The entrance to the fortress "Shadowguard", the castle of Minax, is guarded by hordes of not so dangerous monsters. If you have arrived by plane, you can even risklessly fly over them and park right next to the entrance to the castle. A map of Shadowguard. Minax is at first in the room at the upper right, protected by deathly energy barriers. Between that demons are patroling of which some are invincible. Also do not forget to visit the "museum" and the "satanistisc chapel"! The big showdown: the dark magician defends herself with energy flashes that cost 100 hit points per move! Time Doors transport you to a different place and into another time. The time differences can be minimal. You only need to steer your character into the rectangle and then it will find itself, after some loading of the floppy, at a different place. The time doors are often the only possibility to enter islands and with this castles. Fight against all creatures that you meet outside of towns and villages. This way you will receive gold and useful items as torches for the dungeons, tools to deactivate traps and much more. However, you should not fight in towns and villages as you will be instantly killed by the very strong guards. You should rather talk with the people here (transact). Thus you get hints to the solution of the adventure and with this to the destruction of the magician MINAX. However, you only get valuable hints from the innkeeper in the tavern or from the very expensive oracles and fortune-tellers. You will notice that fighting is a very important factor in this game. An important reason is the rising up of the single levels by fighting for many EXP. points. Reaching the highest level is also helpful for the sucessful ending of your heroic deeds, as the probability for the appearance of useful items after defeating an enemy is linked to to number of already reached experience points. An important factor for survival is the raising of the HIT POINTS. For this you go to a castle and stand before the king. Then you enter T(ransact) and you get subtracted some gold and get H.P. added. Notice that the prise rises after 5000 Hit Points. To guarantee the permanent supply of food, you can choose thieve as a profession. This way you have good stealing skills and can often get food for free. This way you can also steal equipment and weapons without getting rid of gold. Of course you should not get yourself caught, because even in the smallest village there are guards who keep peace and quiet. When the player has tried several times to steal from someone without success, he will be chased and killed by alarmed guards. For this reason you should always have an escape path ready. A fight with the guards, however, is unavoidable. Only they own a valuable key that unlocks all locked doors in the universe of ULTIMA II. Even in the most favourable circumstances is it impossible to defeat the guards in the castle, therefore you'd better keep away from them. Concentrate on guards in villages and towns. They can be defeated by you in certain circumstances. One important condition is a HIT POINT number of about 3000 and a preferably short escape path to the outskirts. At a pinch you can stop the time with one of the "strange coins" (if available), with the key N to be able to escape before you are surrounded and born down by further approaching guards. The keys are compulsory for many things. First, there is the prison inside a castle. Here, creatures of all races are locked, with the key you can free some of them and get hints. A rule of thumb here is: all people that move up and down in their cells are not useful for you. You should free the ones that are standing still and ask them with T(ransact). Another important use of the key is in the port, because you will need a ship in any case and with the key you can unlock the door to the port. Furthermore you will reach with it planes and rockets. And now the last and most important function of the key. As already mentioned are oracles and fortune-tellers the most important source for tips; without these you cannot procede. But unfortunately, they are all behind locked doors and only a key enables you to ask them. A good possibility to gather a big supply of keys is the town "Pirate Harbour" in the time zone 2112 AD, but you need a key first to unlock the gate to the port. Then you can strike dead the docker, steal a frigate and relatively easily eliminate all the alarmed guards with the help of the board cannons. However, you should for safety reason already have 3000 HP. With the power armour you can also explore the universe without dropping dead a few seconds after the start ("You exploded!"). "Planet X" is at the coordinates 9-9-9 and needs to be reached by hyperjump (H ). Be careful when landing: you can only land the spaceship on an open plane! It is only worth visiting the dungeons and towers if you are in a rush to find the Tri-Lithium that you need for going into space. There are bigger amounts of it on every 16th floor of each dungeon/tower. Tri-Lithium can also be found randomly after defeating an emeny in the upper world, but the chance for this depends on the EXP points you have already reached. However, you only need 4 units of Tri-Lithium to reach "Planet X" and then return to the earth after that (coordinates 6-6-6). The puzzle for the destruction of Minax: The castle of Minax is surrounded by a protective shield that can only be broken with a magical ring if you do not want to lose 1000 hit points with every step through the shield. You can get this ring from an old man in New San Antonio. But he will only fork out the valuable gem if you have obtained permission from a certain Father Antos on "Planet X". Furthermore you will need the "Quick Blade", to be able to harm Minax at all. This blade is in possession of an inmate in the prison of San Antonio, who sells it for 500 gold pieces. 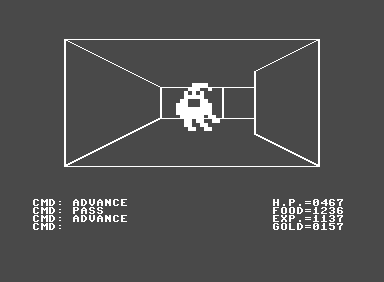 In the end fight Minax teleports herself into a room that lies at the opposite end of the castle after the first blow and returns into the first room after the next blow. This goes on for a few times until Minax finally disappears and the game is won. A congratulation message and a plug for the graphics adventure "The Wizard and the Princess" appear which you could play next now. 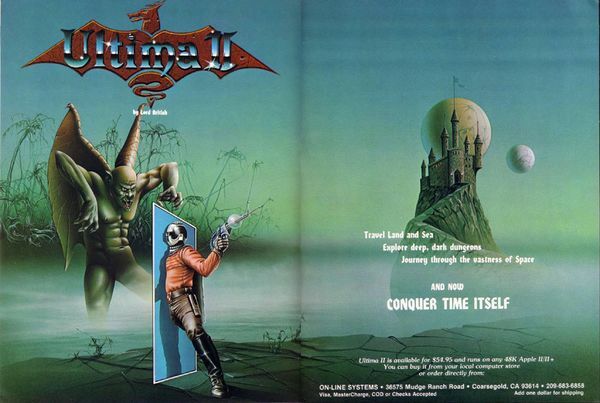 H.T.W: "Ultima II was at that time probably the breakthrough in this series and for many people it was the access to the role play game world on the computer. I never really was a fan of this genre (and I am still not today), but it got me anyhow and I was fascinated for weeks. 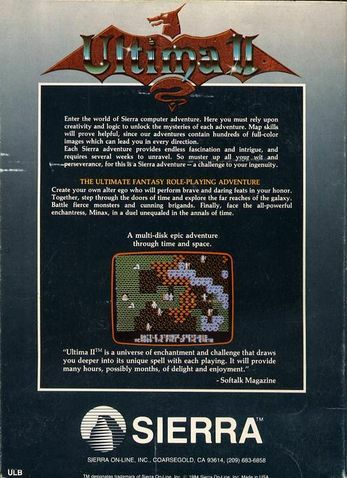 The controls and graphics would be called rather lowly today, but after some time of playing and after reading the manual it is still interesting to explore the world of Ultima II with the help of horses, ships, planes and spaceship, to solve quests and let yourself get transported through time and space by the Time Doors that only appear at certain times, to bash monsters in dungeons and interrogate everything and everyone. Absolutely recommendable!". 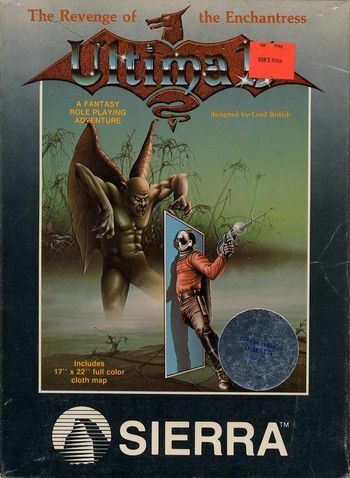 Flodder: "Ultima II was at that time for me the access to the world of role play games and the start of a passion for the genre that lasts until today. The graphics are minimalistic, but this is exactly what calls the player's attention to the very dense atmosphere of the game. If you are ready to put aside today's usual fixation on magnificent graphics and grandiose dubbing and occupy yourself intesively with the game, it can make you dive into a fantastic world full of magic. I give 9 out of 10 points for the fantastic gameplay". Robotron2084: "I cannot share the exuberant euphoria of the previous posters. In my opinion the game is a bit too much based in the more or less dull "grinding", i.e. the routinely bashing of monsters until the random generator finally spits out the required items as sailor suit, the time stop coins the Ankh etc.. There is also no possibility to get quick access to money to be able to buy better weapons/equipment, so that I was forced to press constantly "P" in the game to generate enough monsters and with this gold. I am also gutted about the fact that the dungeons are almost completely useless, same as approx. 75% of the rest of the admittedly huge game world. Already in the 80s I found it harder to find and evaluate the only scarcely scattered and confusedly expressed hints than in comparison to Ultima III - Exodus and Ultima IV - Quest of the Avatar, which I have also played succesfully until the end. E.g. how am I about to know that you need to pay at least 500 gold to get the "Quick Blade"? I often only commuted between two to three locations and waited until I had collected the necessary gold supply for being able to do the next step. The in some parts facetious humor of the game ("Will you buy my apples? ", "Pssst...wanna buy a watch?" etc.) rescues Ultima II from vanishing from the scene and of course also the fact that it is a part of one of the most important role play game sagas. But I did have rather little fun with it. 5.5 out of 10 point. An akward but useful but allows for building a land bridge over the big pond or (provided you have enough patience) even around the whole globe by "wondrous multiplication" of hostile frigates. Bug: The game has an unpleasant rollover bug: as soon as more than 99 pieces of an item (e.g. torches) have been found, the number is reduced to 1. The same happens when you have more than 9900 hitpoints! Furthermore it is possible to "clone" as many new ships as you like from a pirate frigate. For this you need to enter the hostile ship (a "blue tassel" - a sailor suit - is the requirement) and make some moves forwards. Another pirate ship will be created that still is hostile towards you, but can be entered with the same procedure and be duplicated anew (s. image on the right). Ultima II - The Revenge of the Enchantress! is the second part of the Ultima series. If was released for the C64 only after Ultima III - Exodus. As there was disagreement between Richard Garriot and Sierra concerning the licence fee payment for the PC version, Garriot decided to found his own company Origin Systems. 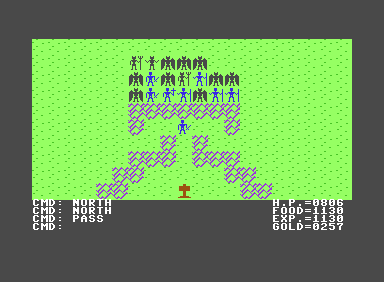 Ultima II was the first game by Garriots, that was programmed completely in Assembler. 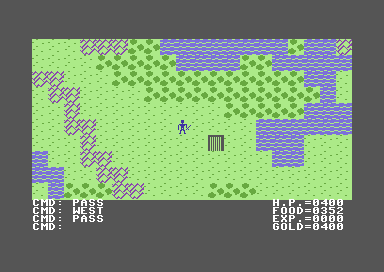 As they completely went without Basic in Ultima II and the game is built up relatively simply, it is up until now the fastest Ultima title on the C64. The map that was enclosed to the game was according to Richard Garriot inspired by the Terry-Gilliam movie Time Bandits. 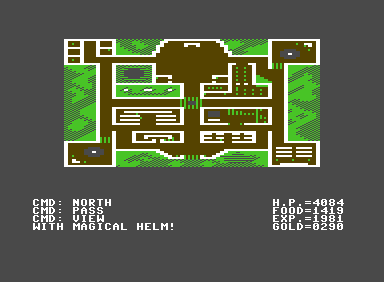 In the first two releases the map was printed on cloth (Apple II and Atari 8Bit). In later releases they resorted to paper, sometimes not even printed in colour. 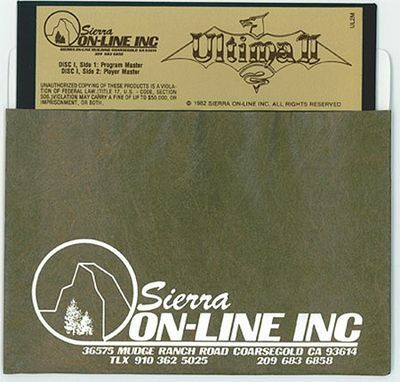 Ultima II is the first part that deliberately was ported to other platforms than the Apple II. The Apple version in the Ultima Trilogy I,II,III box is graphically spiced up. But as it was offered only for a short time, it is very rare. The C64 version in the trilogy package does unfortunately not offer this special feature. The C64 title sequence from Ultima II - The Revenge of the Enchantress! 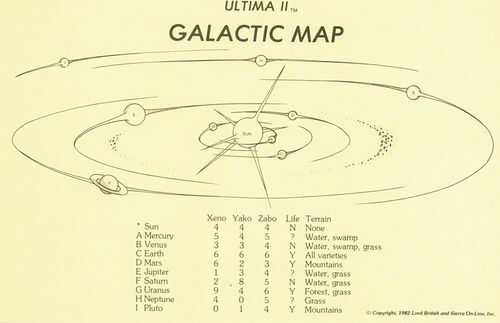 This map was enclosed to the game. 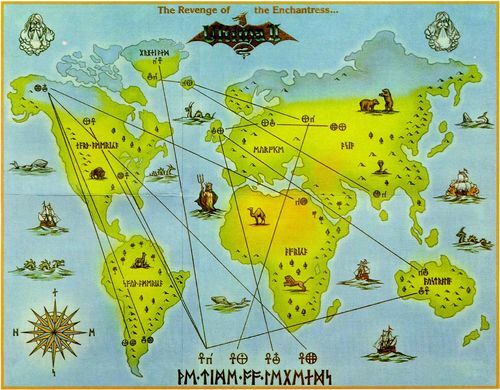 Ultima II was the first Ultima game to which a map was enclosed. This page was last modified on 25 September 2017, at 17:49.